As you get closer to retirement, you should be contributing as much as possible towards your retirement accounts as possible. As of 2018, the maximum amount you can contribute to a 401(k) each year is $18,500 and a Traditional/Roth IRA is $5,500. If you are over 50, you can contribute an additional $6,000 to your 401(k) and an additional $1,000 for a Traditional/Roth IRA each year. It may be helpful to reach out to a financial advisor if you need help in the final years leading up to retirement. The last thing you want to do is spend your hard earned retirement savings on paying down debt. If you haven’t already, now is the time to come up with a Debt Elimination Plan. Start with your debts with the highest interest rates as this will help you save more money in the long run. As you near your retirement age, you’ll begin to have a clearer picture of what your like is going to look like, including how much money you will have available. Once you have a fixed income, it’s important to make sure you know where every dime is going. 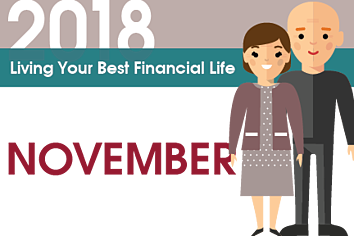 In the months leading up to your official retirement, start living on this budget so you can make necessary adjustments prior to it becoming permanent. You become eligible to enroll in Medicare the year you turn 65. You can begin enrolling up to three months before your birthday. If you are already receiving Social Security benefits, you will automatically be enrolled once you hit 65. Some people choose to delay receiving Medicare in order to increase their benefits. For example, full retirement age for those born between 1943 and 1954 is 66 years old. If you decide to retire early, you will not receive your full benefits. However, if you choose to delay until you are 70, you could receive 130.67% of your benefits. You can learn more about delayed retirement by clicking HERE.